Just play it imo / never know when opp will if come again. Sell 50% with the caveat that you feel might be a jump ability wise and its just for the feelgoodz spin would be my advice. Poker has a weird sense of humour. Trust in it! Is there any info on the live sats? Blind structure, reg times etc? Is Event 5A The Hendon Mob Championship going ahead on Tuesday? Drop in and ship your ticket just before we kick off ! Last edited by Irish Poker Open; 15-04-19 at 06:10. Apologies if answered before but buying in with PP$, once completed you just rock up on the day? Do you expect cash games to be up and running this afternoon? Yes, that is the case, however the only stipulation would be the Heads Up Event - you need to be at the Registration Desk for your seat allocation at 12 noon on Tuesday (Event starts at 1PM), otherwise the seat will be released and your name will be placed on a cancellation list as the event is currently almost sold out. Cash games have been going 24 hours since the start of the Norwegians - currently 2 cash games on the go with a 3rd opening shortly. For people who have qualified online from party is their another way to reg for your day 1. So I am looking to play day 1C for example and want to avoid the reg queue on Friday if possible. We have a partypoker Team over from the UK that will be looking after partypoker buy ins and tickets - I am waiting on information as to how this process will work. Currently over 250 entries in todays €350 NHL 6-Max with late registration open until 7pm this evening! Current prize pool is approx €75,000! Cash action is also underway with 6 cash tables in full swing! Did you win the seat a live or online satellite? If you won it online you can't sell it! 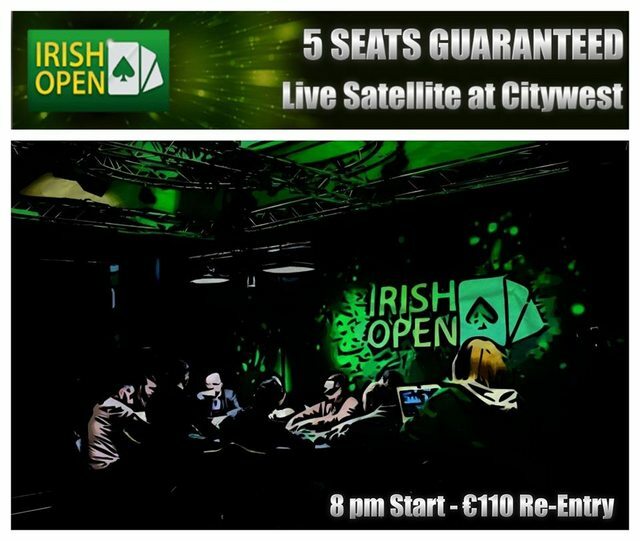 If you win a seat in one of the Citywest Live Sats can it be transferred to another player (even if its your first seat won)? No, all first seats won in the live satellites have to be played by the person who won them. Should be a big one - last nights 5 Seats GTD Satellite generated 12 tickets! If you have already qualified online, can you play the live sat and take the cash if you qualify again? No, there are no cash alternatives for multiple tickets. All Live and Online Satellite tickets won must be used for the destination event. When is the stream kicking off later today? Or later this week? How many seats were there in last night's satellite?